The world of beauty content has been revolutionized in the past few years by the growth in women consuming more content on their mobile devices and by the evolution of video content to deliver helpful information or powerful messages. From the rise of YouTube beauty stars to publishers using more data to inform the topics and trends that they're writing about, consumers now have a wide range of choices when it comes to enjoying beauty content. 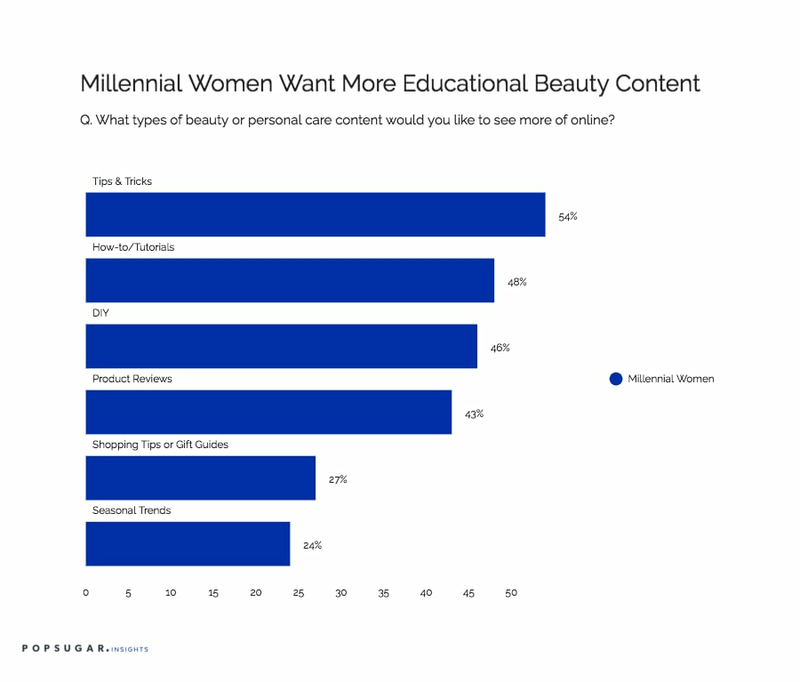 As part of the POPSUGAR Insights study "Beauty Evolved: How Millennial Women Shop for Beauty and Personal Care," we asked women to share the types of beauty and personal care content that they'd like to see more and less of online. Overall, millennial women want more beauty content that delivers value, allowing them to learn more about how to apply the products from an expert's perspective. Over one half of millennial women (54%) are interested in seeing more tips-and-tricks style content, with 48% saying they'd like to see more how-tos or tutorials. Nearly one half (46%) are interested in seeing more DIY tips, while 43% are looking for product reviews to help them make the right choice of products for their skin type. In terms of specific beauty topics and trends, makeup and hair are two topics that are perennially popular across POPSUGAR Beauty, driving a high number of visits, amount of time spent, and number of social shares. Over the past year, we have witnessed a significant rise in the popularity in "real girl" content, with that type of content driving the highest share per visit and time spent per visit of any of the top 25 beauty topics across POPSUGAR Beauty. In terms of specific content types, we've found that there is no list long enough to dissuade beauty aficionados from giving us their time and attention and that top 100 lists are the new top 10 lists, especially within the beauty category. On the flipside, millennial women want to see less content related to quizzes and polls (21%), live event coverage (17%), and inspirational quotes (12%), preferring their beauty content to have more substance and focus more on the tangible benefits of products, tips and tricks on how to achieve specific looks, and helpful advice from beauty experts and influencers who can help them look their best. For brands, there's an opportunity to use data and insights to tap into larger trends and smaller moments to uncover emerging styles and provide more information about the basics of beauty and skin care while creating more content that women want.